Spacious lot with horseshoe driveway. Private and pristine Popponesset Spit beach - 5 min walk. 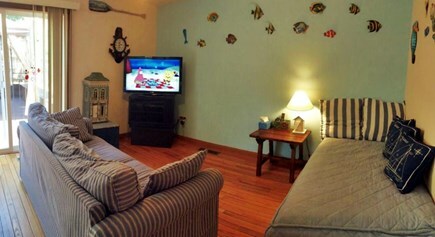 Aquarium family room with day bed convertible into two twins. 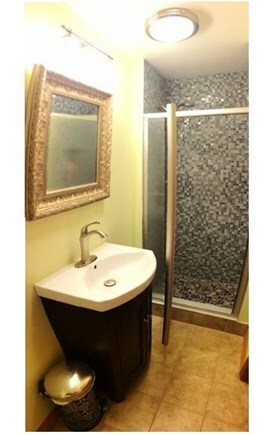 Shower with glass tile walls & foot massaging river stones. 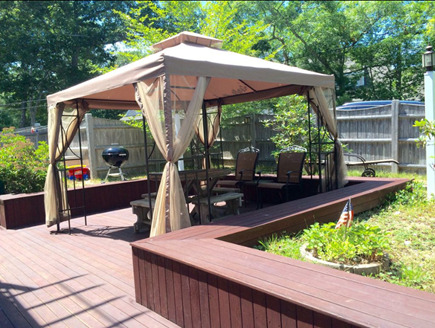 Large fenced deck with netted gazebo. Outdoor shower. We supply natural aromatherapy shampoos. We go beyond limits to make sure guests have pleasant stay. Sun... sand... blue ocean... a true heaven and a real soul retreat. Welcome to the spacious Seaside Villa by the Nantucket Sound of Cape Cod in beautiful New Seabury, aka the Pebble Beach of the East. Our house easily sleeps two families and features 3+1 bedrooms, 2 full and 1 half bathrooms, outdoor shower, 1,850 sq. ft of living space on a 0.27 acre wooded lot. 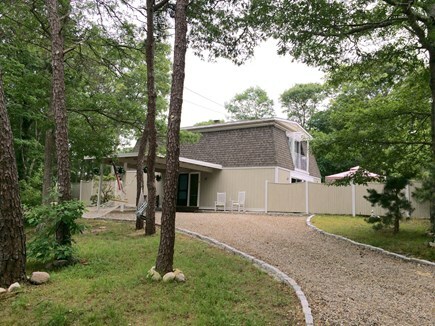 The location is one of the best in New Seabury: by the community house, children's playground, baseball field, basketball court, and bay access. The property is just a short walk to Popponesset Spit Beach and Bird Sanctuary: a unique setting with a calm bay on one side of the spit and an open ocean on the other. House snapshot: Oversized Master Bedroom with 1 King bed, fireplace and 1/2 bath easily convertible into a Master Suite with full bath (2nd floor). 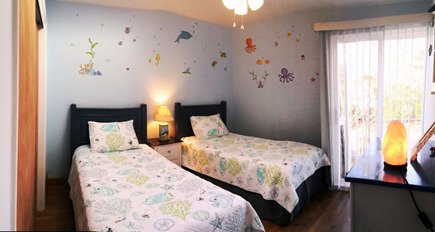 Two guest bedrooms with 2 Twin beds in each room share a full bath (2nd floor). 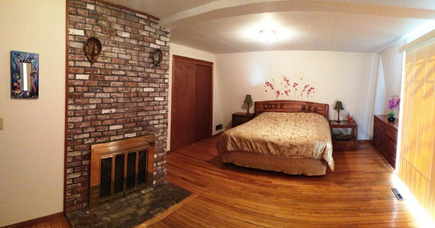 A guest room with fireplace and a day bed convertible into 2 twins (or one King) bed with access to a full bath (1st floor). A family/dining room with a day bed convertible into 2 twins and a queen-size sleeper. We provide linens, bedding, bath and beach towels, natural aromatherapy shampoos and shower gels, large selection of Keurig k-cups coffee, great complimentary tea selection, and much more. Hardwood floors throughout the house, beach chairs, patio with gazebo and furniture, stainless steel gas 3 burner grill, large outdoor chest with beach toys. Full basement with access to washer and dryer. Parking: Up to four (4) vehicles. Free High Speed Wireless Internet with complimentary Internet TV (Hulu Plus, and many more). Check-in anytime after 3:00 pm on your arrival day and check-out anytime prior to 11 am on your departure day. Sorry: no smoking, no pets. The cleaning fee is included in the price. Requires 25% deposit to book. Remaining payment is due 30 days prior to check in. Our family spent a great week at Seaside Villa. The home is spacious, clean and a close walk to the very clean beach. Our grandson(2) loved searching for crabs while wading in the calm waters. 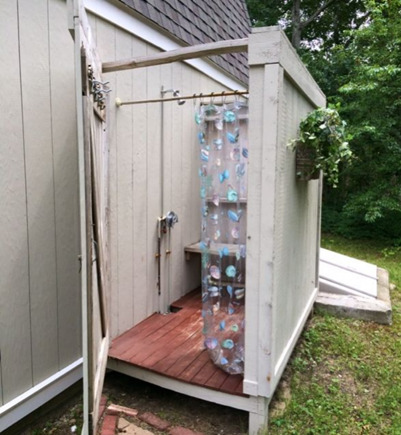 We loved the outside shower and the large private patio was a bonus! We were able to ride our bikes comfortably along the streets of New Seabury. 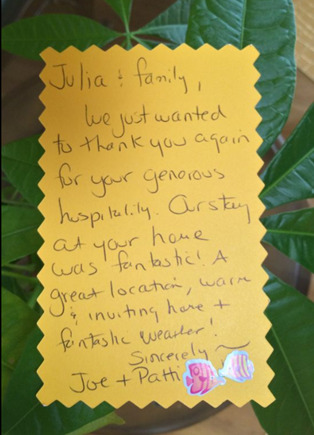 The owners were very accommodating and made our stay wonderful. We highly recommend this home and plan to be back in the future. Great house at a superb location! My family was very impressed with the house. It is clear that the owners put their heart and soul into this place. Everything in the house was functional and useful. It was very clean. 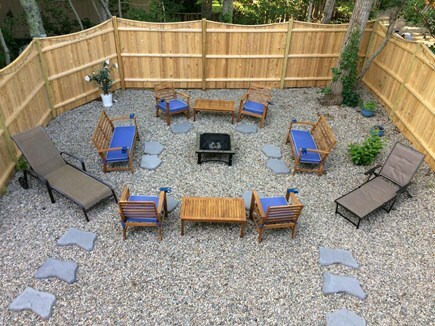 Location is perfect, short walk to the private beach and a kids playground around the corner. Our kids did not want to go back home. Would absolutely stay there again! 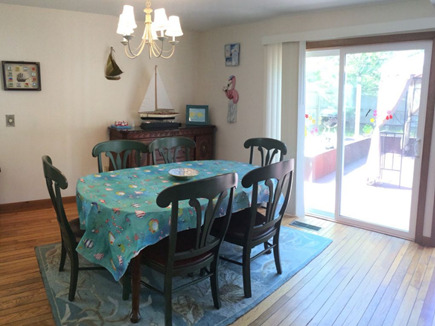 We enjoyed our first stay in Mashpee at this delightful home in New Seabury. The home was very clean and spacious and the owners gave great dining tips. The private beach was perfect with a visit from the ice cream boat. What a treat! I will recommend to family and friends. Our family of four (8 and 3 year old girls) spent a wonderful time at Seaside Villa. 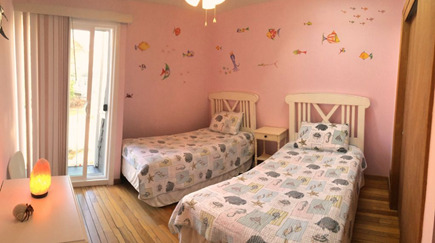 The house is walking distance to a great beach and playground. Wonderful for family with kids. There is a town center with restaurants and shopping very close by. The owners are very friendly and helpful. 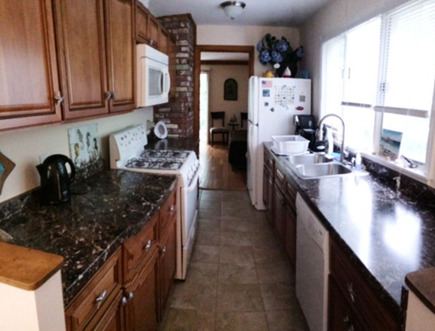 Property was very well maintained and central AC was a big plus. 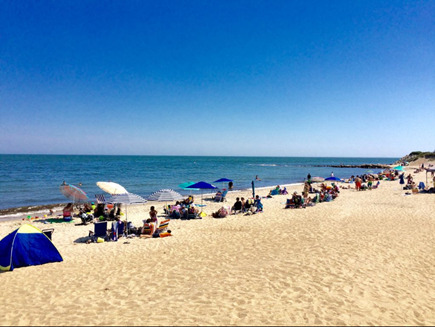 Would definitely recommend this property to anyone who loves the Cape.